I had to order the plywood for the decking, and I wanted to bundle that order with one for a job I'm doing in the shop. Two sheets of occume doesn't hurt as bad when its buried in a $2,800 walnut lumber and plywood order, and I hated to make them come to Brooklyn with just the two sheets, so while I waited for the job to gear up, I worked out the rudder details. 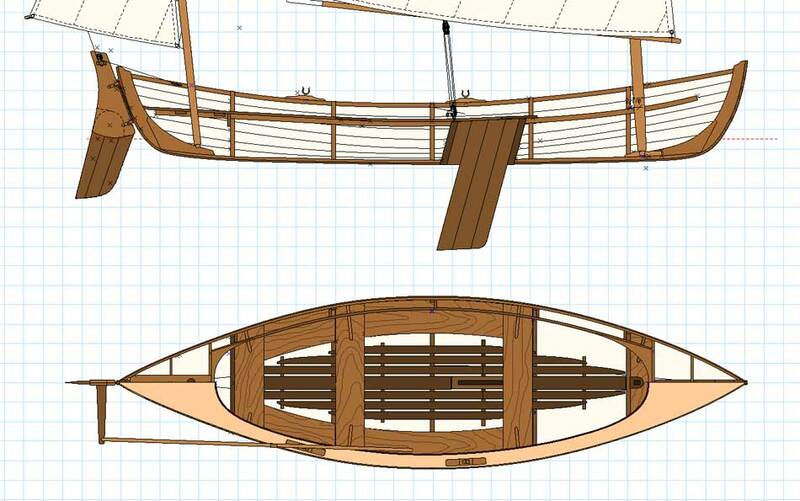 I've drawn four different rudders for this boat over the time I've taken to build it, and I think the last one is a winner. 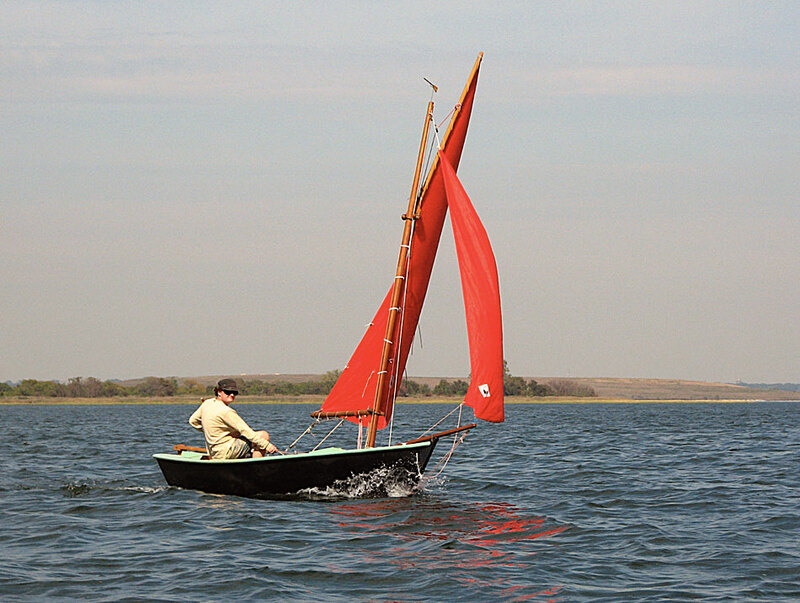 Rudders can be simple, fixed blade affairs like I did on Cricket, but that one is well protected by a deep skeg. I wanted this one to kick up, and I wanted the control lines (up-haul and down-haul) led to the cockpit. I've built a few kick-ups, so I pretty much knew what I was about, but its a tricky bit of design work, none the less. The old rudder design. Blade is swept back. My first kick up type was swept back to mimic the rake of the dagger board. 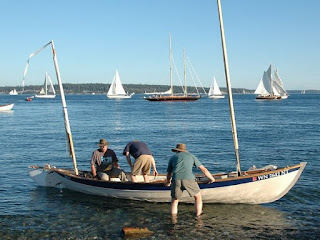 One thing to keep in mind with a raking stern post, is that the geometry of the pivoting blade swings the blade upward somewhat, as well as side to side. 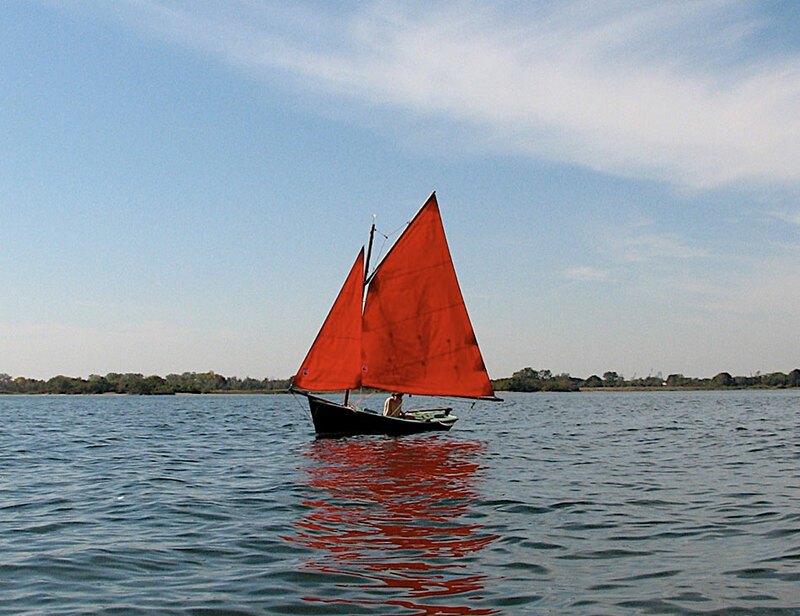 A swept back rudder swinging upward has to move more water in the wrong direction to do the same work as a more plumb rudder, and it could make the boat steer harder. Also, there was something I didn't like about the look of the blade hanging off the stern. I was all ready to cut this one out when I changed my mind, and completely re-designed it! 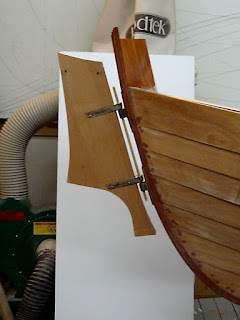 I've been looking at Iain Oughtred's double enders for years, and have always liked his rudder designs. 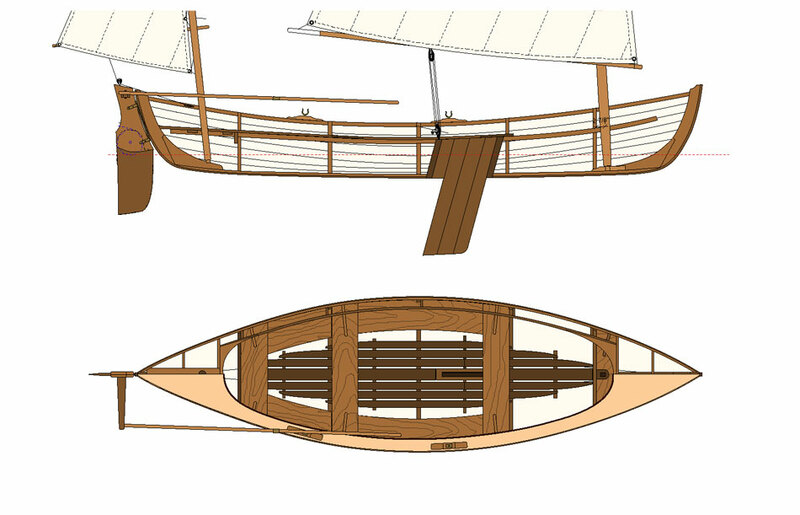 It seemed that a similar plan form would work on the Matinicus, so I redrew mine to better fit the stern post, and to hang more nearly plumb. 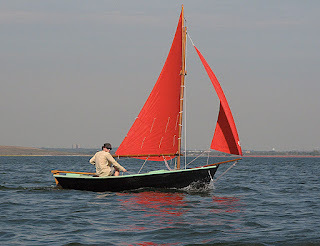 The re-designed rudder, with plumb blade. I took the dimensions from the scale drawing I did in Vector Works (shown above), and lofted the rudder full size on a piece of old masonite. 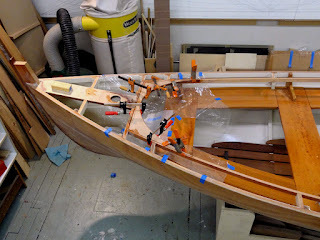 I then cut out the shape and hot-glued it to the boat, using small blocks to represent the gudgeon locations. I also mocked up the tiller arm and long, push-pull tiller extension, to get a feel for the steering layout. A full size pattern was made, and hot-glued to the boat. The "push-pull" tiller was mocked up as well. Here are the gudgeon castings, hung on the boat with a 5/16" dowel. 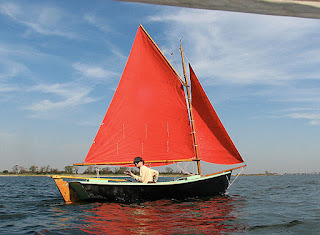 There is a lot of rudder hardware out there, but what Walt uses on his boats, and what he recommends, is a little different than most http://duck-trap.com/rudderfittings.html. There are two sets of gudgeons, one for the stern post, and one for the rudder. The rudder pivots on a 5/16" bronze rod that slides into the holes in the four gudgeon castings. 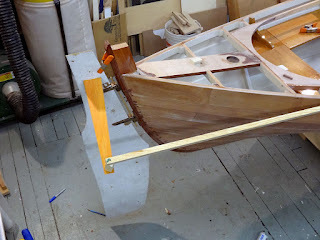 Also, a section of the stern post is dubbed off flat to hang the gudgeons on. The rudder cassette (that's what I call the top section on a kick-up type) measures about 2-1/4" thick and consists of a core 1" thick, and a pair of cheeks, each 5/8" thick. 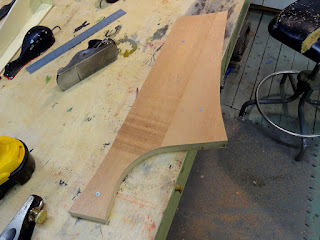 The blade is thicknessed a little less than 1" to allow it to pivot between the cheeks. 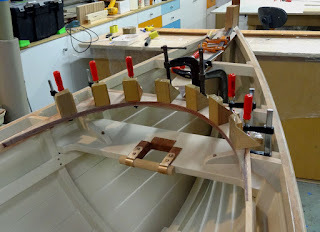 Because the rudder gudgeons are only 5/8" between the straps, they have to be let in to the core, and the cheeks have to notch over them slightly as well. I temporarily screwed the rudder gudgeons to the pattern, and the stern post gudgeons to the boat, and dropped a 5/16" dowel into the setup to mimic the rod that I did not have yet. I verified that everything fit, and pivoted correctly, which is a little fussy to do. I then made a mylar tracing of all the parts from the pattern, and plotted the control lines, and blade pivot. 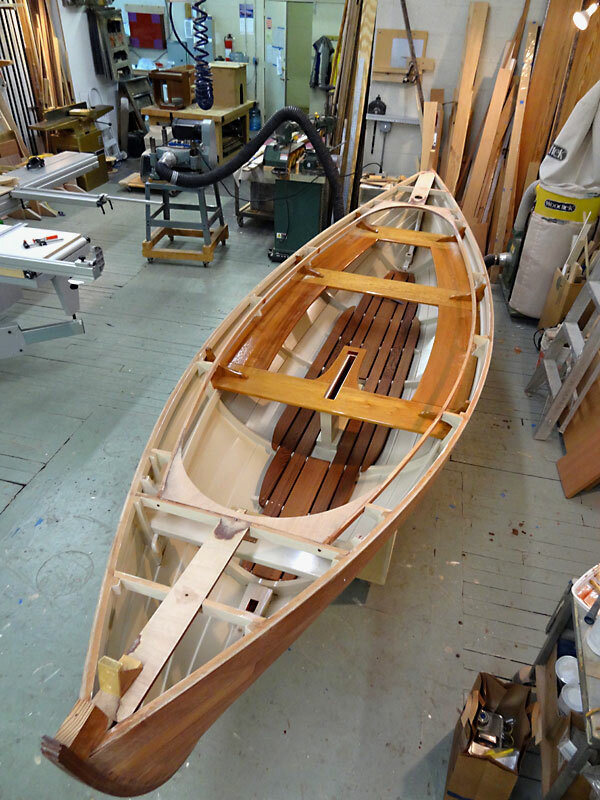 There's a fellow out on the west coast, James McMullen, who built a nifty Oughtred double ender. 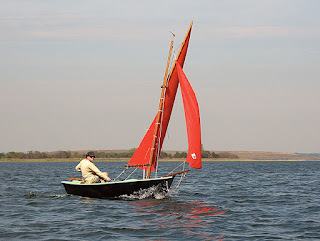 He gave me the idea for using embedded sheaves and races in the core for the control lines, and I am indebted to him for making his pictures available on the WoodenBoat Forum. 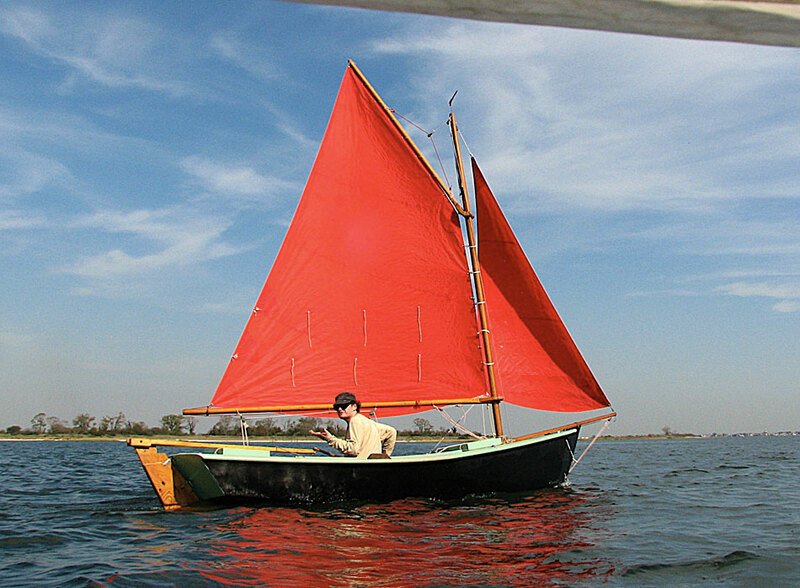 "Rowan", an Iain Oughtred double ender built by James McMullen. 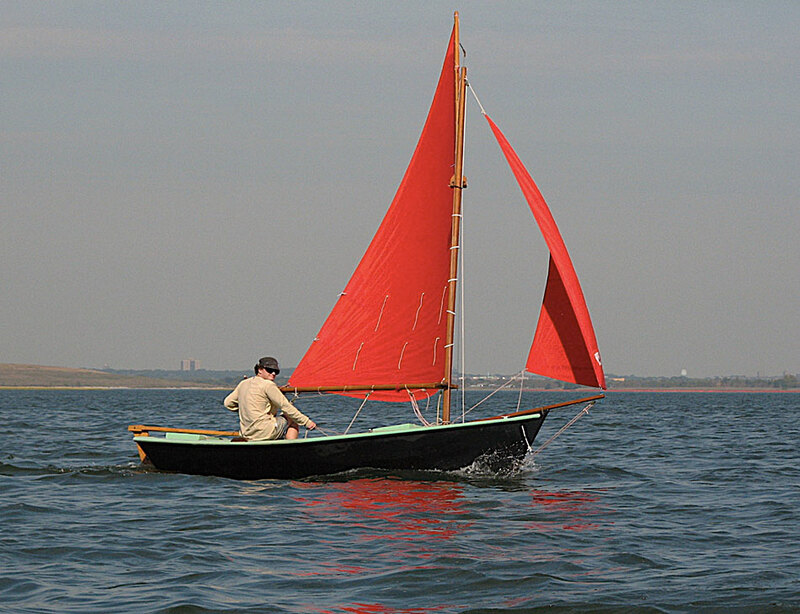 Notice the kick-up rudder. The rudder cassette has to be built from the inside out. 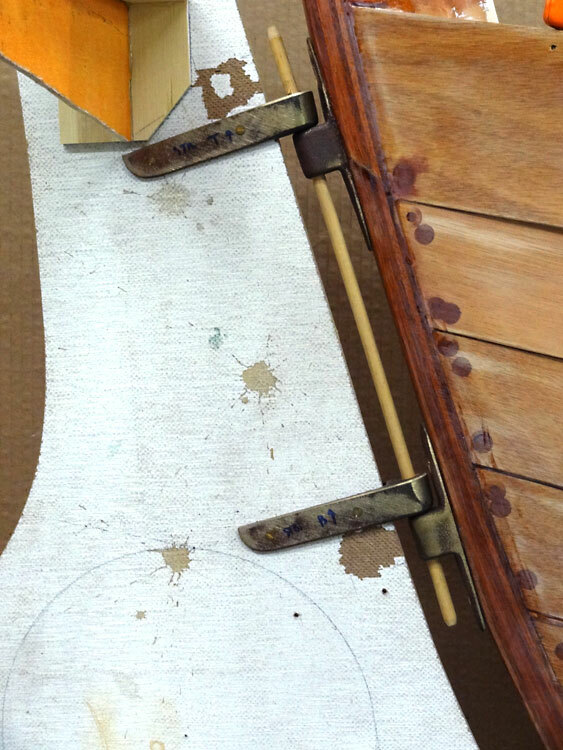 The core is made in two halves, with half the sheave mortise in each half of the core. The race for the control lines is also cut into each half. I drilled a mortise for the sheaves on the drill press, then drilled through one half for the sheave's pivot rod. The two halves of the rudder core, screwed and cut out together. Mortising for the control line sheaves. The two halves of the core, with sheaves and races. I assembled the core temporarily with screws, and mortised in the gudgeons. When all was right, I glued the two halves of the core together permanently. I made a pattern to rout the mortises for the gudgeons. Gudgeons and pivot rod assembled on the core. 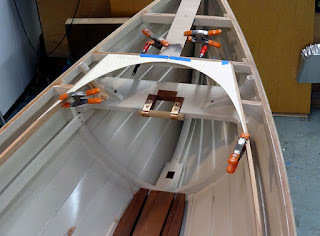 I tested this out on the boat before assembling the cheek pieces. 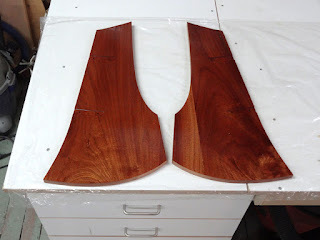 Next, I got out the cheeks from a nice board of sapele I've been saving. I realized that this was the leftover from Cricket's stern seats, and it has a nice figure. I cut them out, mortised them for the gudgeons, and assembled one side temporarily with screws. I drilled out through the core for the sheave pivots, and for the pins that fasten the gudgeons. When that much was all drilled, I put on the other cheek, flipped the assembly over, and drilled through again from the other, previously drilled side. This is the only way to be sure that everything lines up as it should, but its a fussy operation, and equally fussy to try to describe! 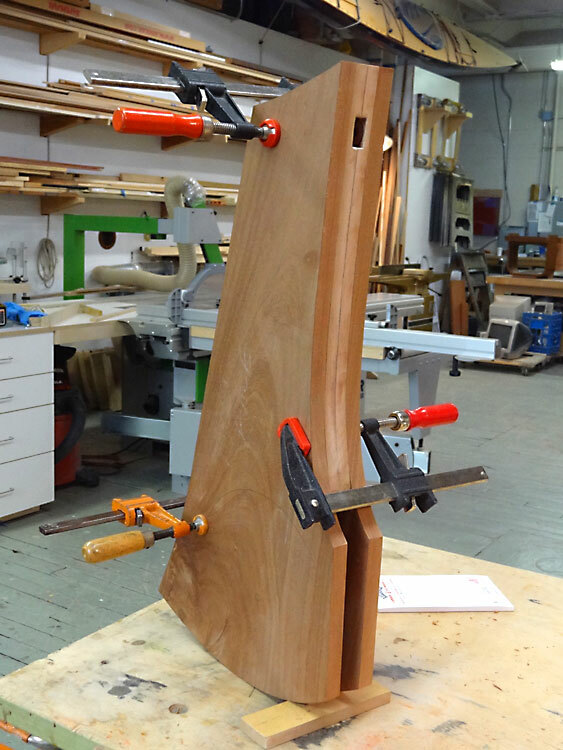 The cheeks are glued up from a nice sapele board I had on the rack. Cheeks are dry assembled on the core. 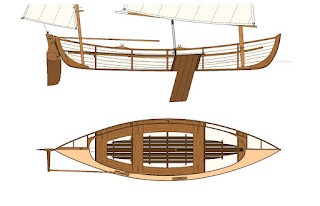 Notice the up-haul sheave mortise at the top. I epoxy coated the inside of the cheeks before assembly. 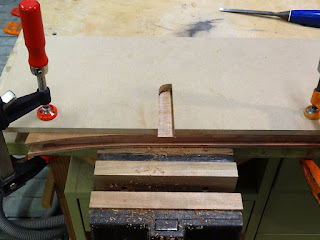 Way back in an earlier post, I described laying out the oval deck ends. 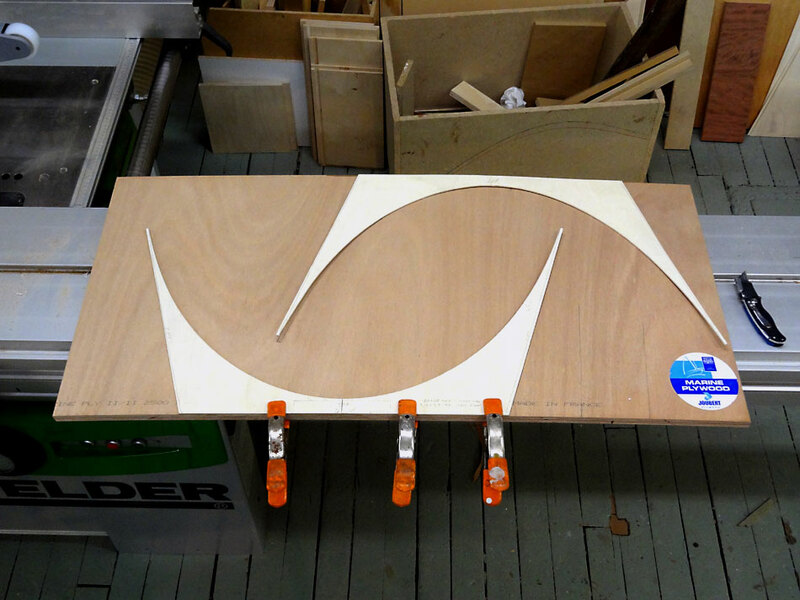 I made thin ply patterns of the oval beams to use when I later made the beams themselves. 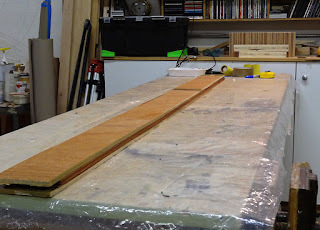 From a previous post- Laying out the oval deck shape. 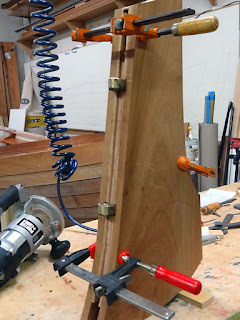 At the same time that this was going on, I was vacuum-bagging some curved doors in the shop and had all the materials to hand and the bag set up, so I decided to laminate some scrap occume ply on a curved form to saw the beams from later. Fast forward a few months, and here we are finally getting back to those beams. 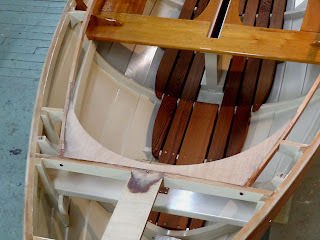 Once the carlins were permanently installed, I pulled out the original oval beam patterns to check the fit. The aft pattern was still perfect, but the forward one was a tad wide, so I cut it in half and reduced the width slightly to fit the carlins. Checking the fit of the oval beam patterns. The trick with all of this, is to blend the curve of the carlins seamlessly into the oval ends. To help with this, I decided to notch the beams into the carlins slightly, avoiding a feather edge on the beam ends which would be too fragile (the squared off ends of the oval beams are evident in the photos of the patterns). 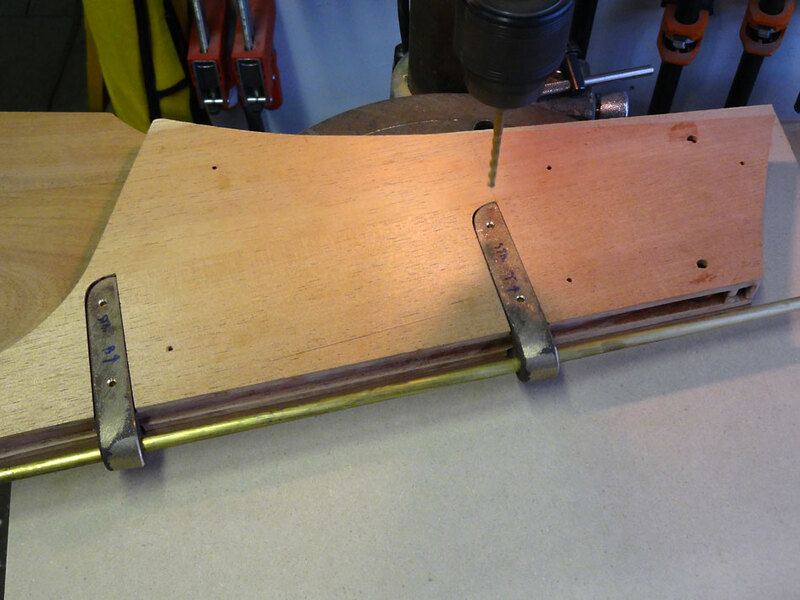 I laid the patterns on my laminated, curved plywood stock, and cut out the beams. 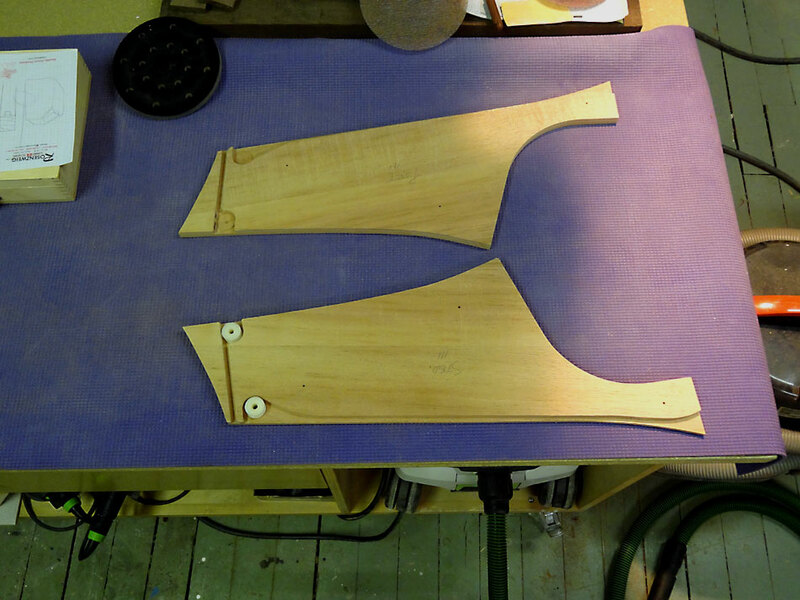 Both patterns are laid out on the laminated, curved plywood stock. 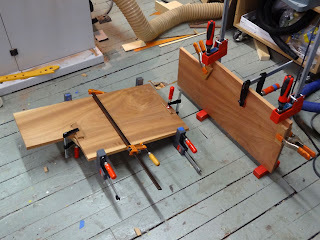 Though I don't have a photo, the rabbets in the carlin ends were cut with a router using a top-bearing pattern bit, and a scrap of ply clamped on for the pattern. 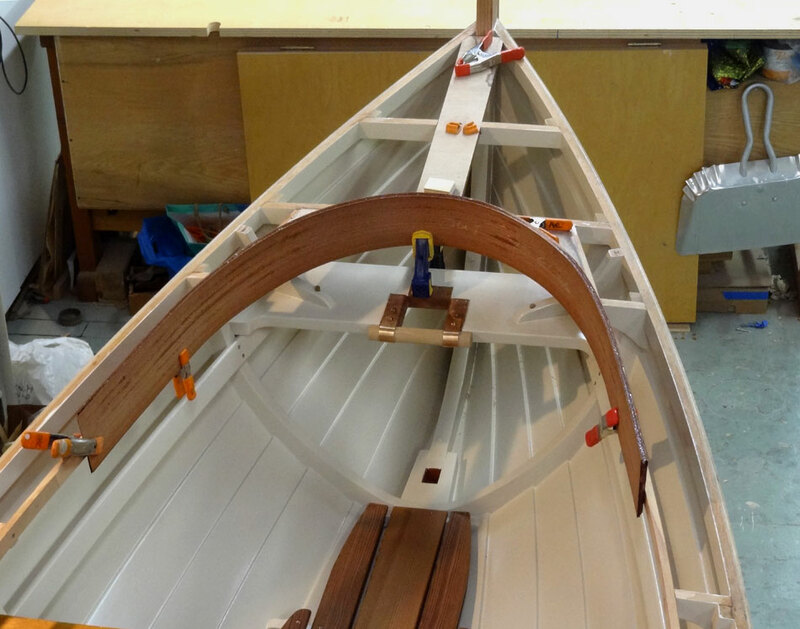 When everything fit satisfactorily, I glued in the beams. 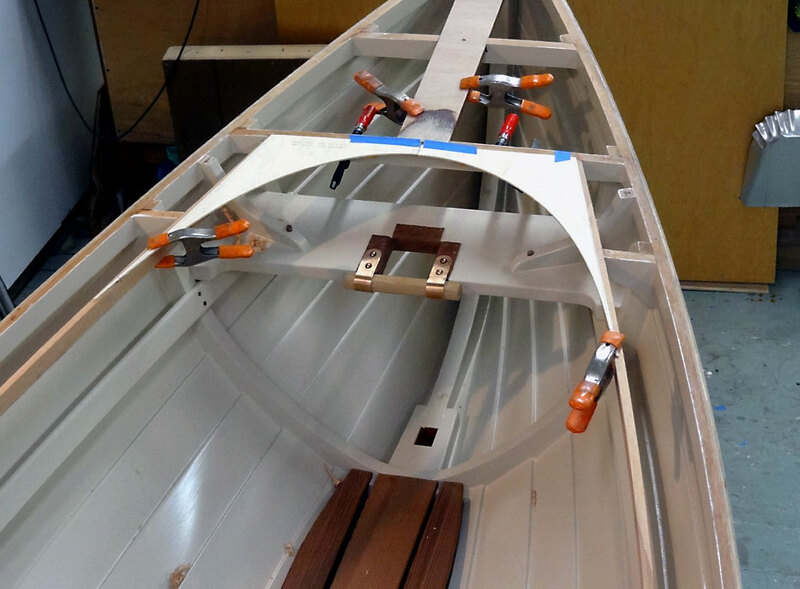 Plastic is used in the hull to keep the epoxy off of the finished boat! Gluing the oval beams in the boat. After gluing, the beams were faired into the deck structure. Notched carlins are visible in this photo, if you look closely. In retrospect, this whole curved beam business could have been simpler and quicker. 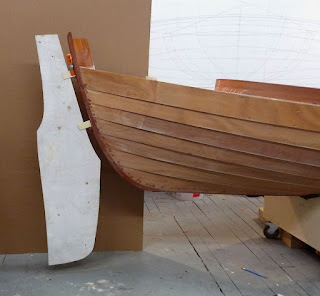 If I do another oval deck, I'll just saw the deck camber into a couple of thick pieces of solid wood, glue them in oversize, and cut out the curve right on the boat. 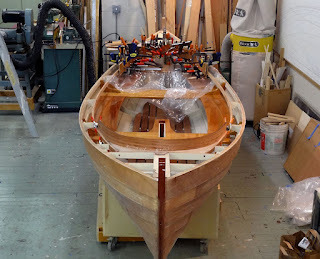 It will be a little harder to clean up the cut on the boat rather than on the bench, but if done in soft wood, that should not prove too difficult. At any rate, the beams are in and the curves are fair, so we'll move on to the next step. 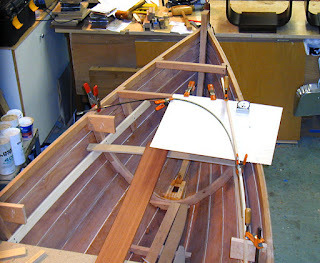 It seemed prudent to laminate the oval coamings before decking the boat, while I still had some structure to clamp to. My usual veneer supplier stocks "special thickness" veneers in several species. 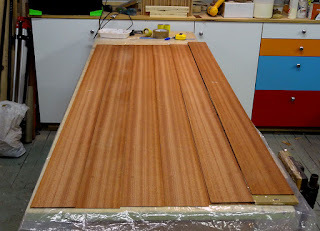 I ordered some 1/16" ribbon sapele from them to make the coamings. Using these veneers is much simpler than resawing the stock myself. 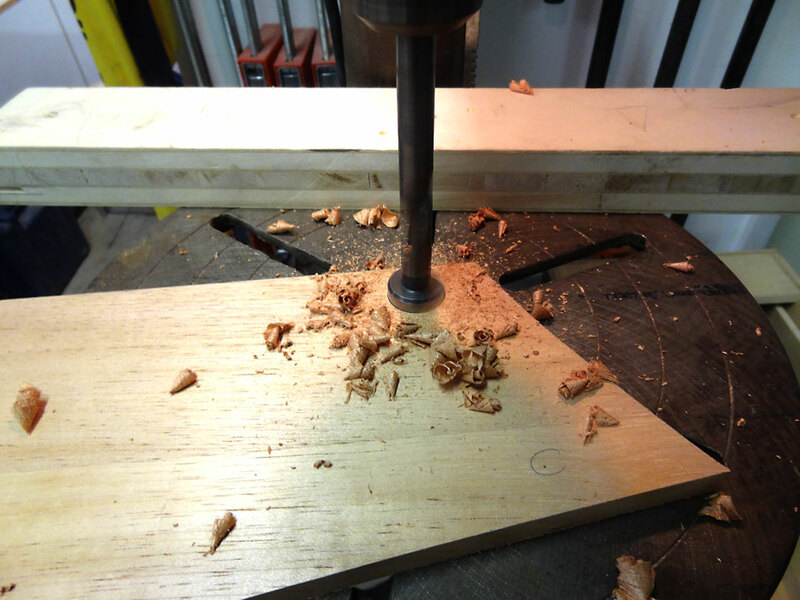 I will have to match the grain to the solid stock that I use for the straighter portions, though, so it is somewhat of a trade-off. Ribbon sapele is fairly easy to match, at any rate. A stack of 1/16" sapele veneer, to laminate for the coamings. Several years ago, I made up a pile of little "L" shaped blocks that can be screwed or clamped down along a curve to laminate to. I've used these same blocks many times, for a variety of projects, including a set of "half-bone" sprit booms for a Herreshoff 31, akas for a sailing outrigger, the outer stems for this boat, and now the oval coamings. I clamped these around the curve of the deck, and glued up a stack of veneer sandwiched between masked off strips of 3/8" "wiggle-ply". "L" blocks are clamped around the perimeter of the beam. The sapele veneers are sandwiched between wiggle-ply cauls. 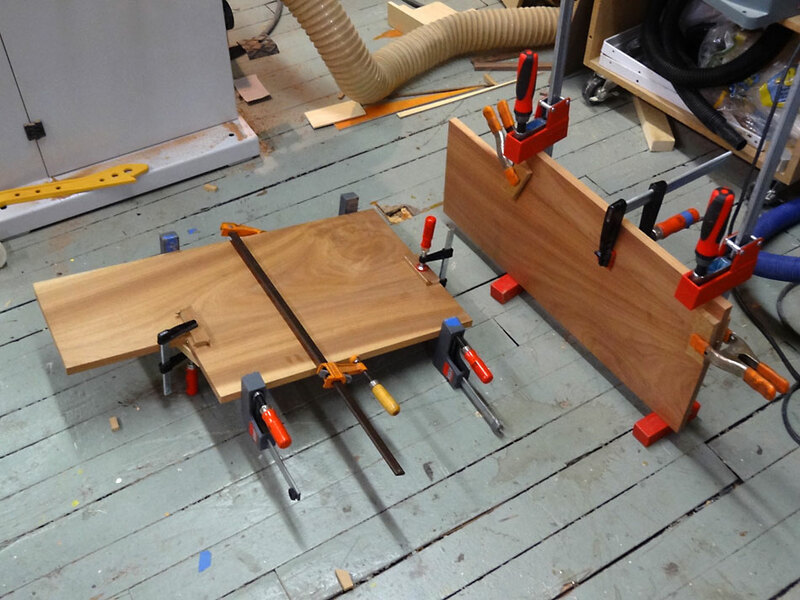 The glue-up used pretty much all of the small clamps I could lay my hands on. 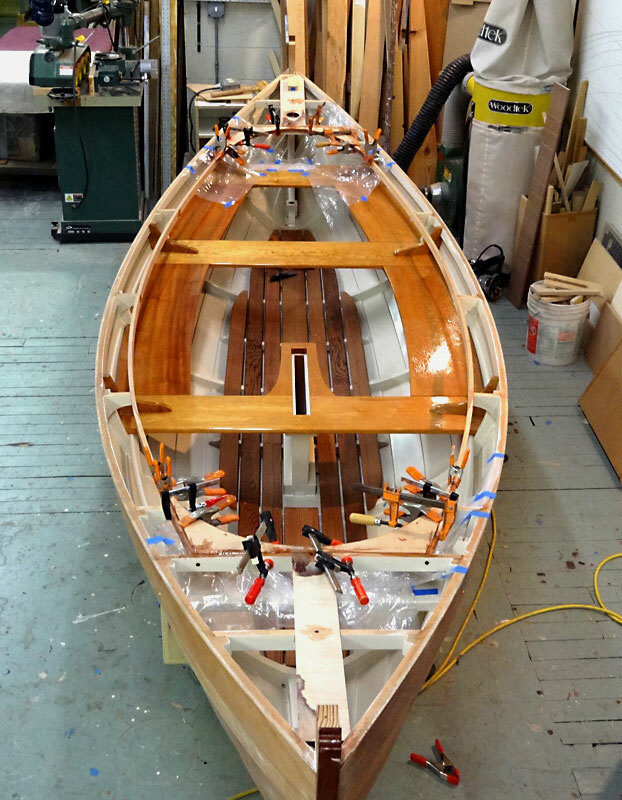 My friend Matthew, builder and sailor of a gaff sloop rigged skiff named "Glory Hole", came by to help me with the glue-up. We did one end on Friday night, and the other end Saturday morning. 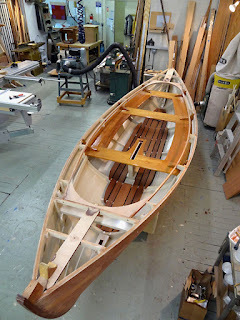 The raw coaming blank. 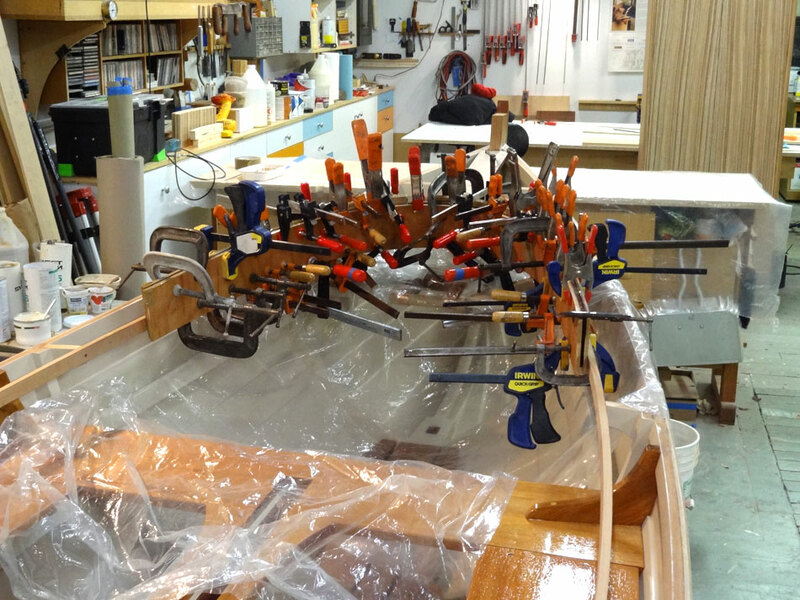 Aft coaming is being glued up. We'll set these aside now, until we finish the deck.